Very easy to do, impromptu and with a big effect! What else would you ask? 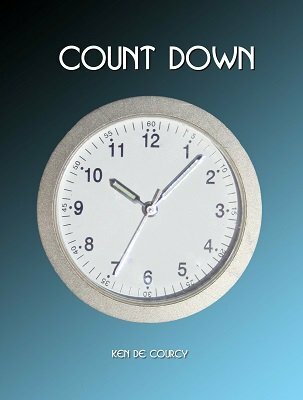 Count Down by Ken de Courcy is a card trick that you can present in several ways, all well explained in this little manuscript. The basic effect is the following: A spectator shuffles his own pack (Yes! It can be his own pack of cards and he really shuffles it...), then counts ten cards in a reverse order. If a number of spots on a card happens to match the number he is counting aloud at the time, the card is thrown out face-up. If none match during the count, a card is dealt face down in front of the magician. This count is made four times. When it is concluded, he has four cards on the table in front of him. They may be all face-up and the balance face-down. The number of spots on the face-up cards are counted, then the spectator counts down to that number in the pack and turns the card over. The performer opens his wallet, which has been on the table in full view all the time. Inside is a duplicate of the card just turned over. Several presentation ideas are detailed in the manuscript. A little gem that you will use over and over again. Real usable magic for real audiences. 1st digital edition 2014, 3 pages. 'Count Down' is a great trick and well worth the small price. The routine is simplicity in itself, you'll never forget it and the method for the most part is self working. The deck can be borrowed, providing it's a full deck.